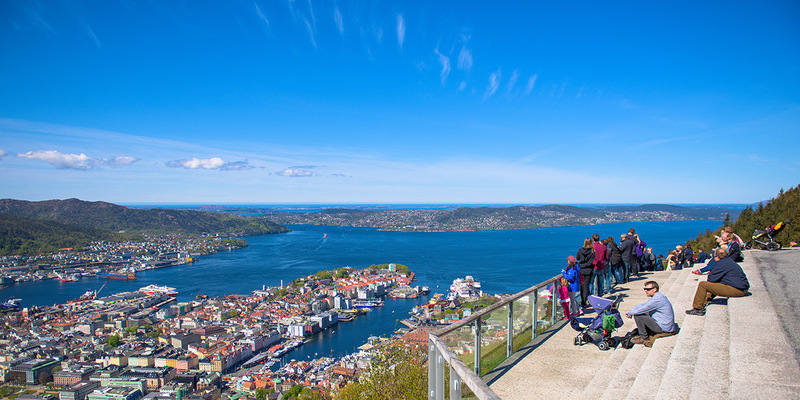 When you arrive in Bergen with Fjord Line, you'll find that most of the attractions that the city between seven mountains has to offer are all within walking distance. Walks along Bryggen, climbing expeditions at sunset up to Fløien. Beautiful, wild and picturesque Bergen needs no introduction. 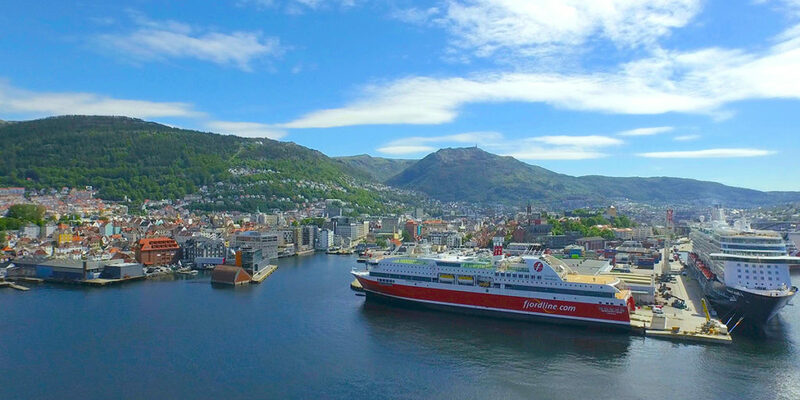 When you sail into Bergen with Fjord Line, you arrive in the very centre of the action. You’ll quickly and easily be able to reach most of the city’s renowned attractions on foot from the terminal. Below are our best suggestions for what you can experience in the beautiful capital of western Norway. Fjord Line’s cruise ferry MS Bergensfjord docks at the Hurtigruten terminal in Bergen. You’ll see the car booth to the left when you drive in to the port area. Yes, toilets are on the 1st and 2nd floors. Accessible toilet on the 1st floor. We recommend using the “Klostergarasjen” and “City Park” car parks in the city centre. Coffee machine and café are on the 2nd floor. No. ATM available on board. The ticket office accepts NOK, DKK and EUR. Coins are only accepted in NOK. Accepted cards are Norwegian debit cards, VISA and MasterCard. The popular attraction, also known as Tyskebryggen and Hansabryggen, includes the old wooden buildings in the historic town centre. The area dates back to 1070, and from 1360 to 1754, it was the location of the German “office” of the Hanseatic League in Norway. You’ll be treading in very historic footsteps here! Today, Bryggen consists of 13 properties of protected buildings and is on the UNESCO list of World Heritage Sites. Along with Bryggen, Fløibanen funicular is a must-see for any visitor to Bergen. The 800-metre long funicular will take you all the way up to the observation point at Fløien station (320 metres above sea level). Here you’ll be met by a quite spectacular view. The funicular, which first opened in 1918, is Bergen’s most popular tourist attraction with 1.5 million passengers per year. At the top you’ll find a kiosk, souvenir shop and a restaurant connected to Fløien station. The famous Fisketorget (fish market) is one of Norway’s largest and most exciting outdoor markets. Here you will find fresh seafood and plenty of locally-produced fruit and vegetables. Why not pick up your dinner while you visit? The market square has been an important trading location in Bergen since the 13th century, and Fisketorget is active all year round. It’s definitely worth stopping by! At Bergen Aquarium, you can wander around 60 large aquariums filled with underwater environments, including salt water, fresh water, tropical salt water and tropical fresh water. The aquarium has more than 300 different species in its collection and aims to provide animals and fish with the most natural living conditions possible. It also boasts four outdoor pools which are home to penguins, sea lions and seals. The aquarium also has a tropical section where the more daring visitors will find snakes, crocodiles and spiders. 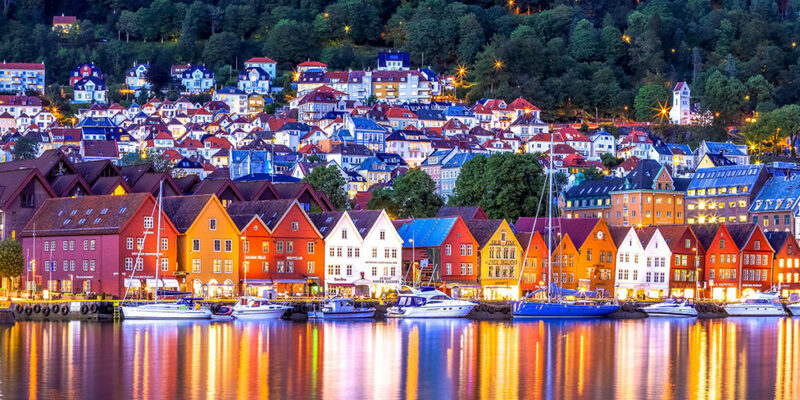 Culture lovers will fall for Bergen’s large selection of galleries and museums. We especially recommend beautiful Troldhaugen, which was the home of the world-famous Norwegian composer Edvard Grieg and his wife Nina. The couple lived here from 1885 until Grieg’s death in 1907. The house itself is a typical 19th century wooden villa with an impressive tower offering panoramic views. Close to Troldhaugen lies Siljustøl museum, part of the former home of composer Harald Sæverud (1887-1992). When arriving in Bergen, follow signs for Jekteviken/DK. The nearest bus stop is Olav Kyrres gate or Møhlenpris. There is a taxi rank outside the terminal. Please arrive at the terminal in Bergen at least 60 minutes prior to departure. Check-in closes 20 minutes prior to departure. All days from 11:00 to 14:00. Between 12.00 & 13.15 we prioritize passengers traveling the same day. Some waiting time must be calculated.